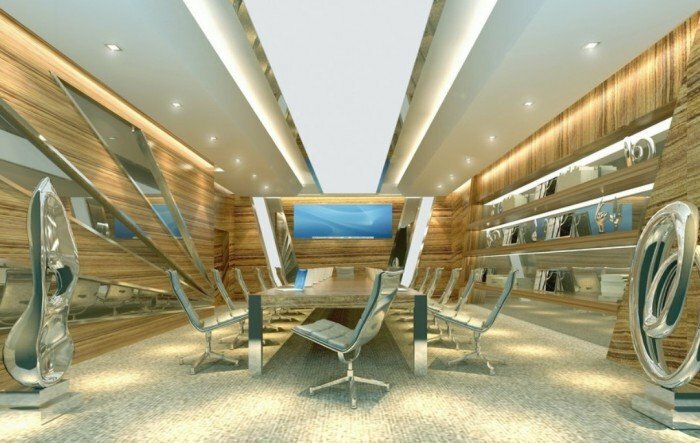 Interior design encompasses a myriad of styles. There is a world of discovery out there for those that are interested. 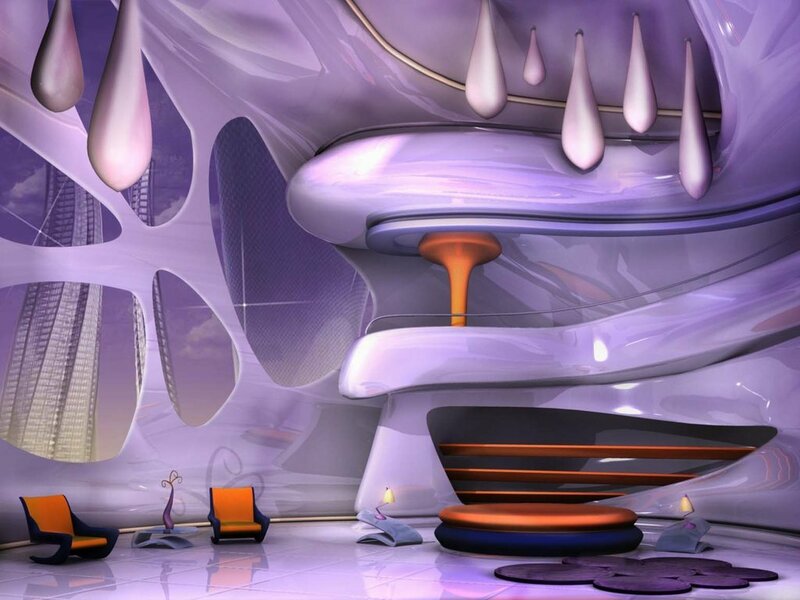 And within that expansive world there are designs that transcend a particular niche and can only be described as surreal or futuristic. You may also consider this realm of interior design as cutting edge or avant-garde. 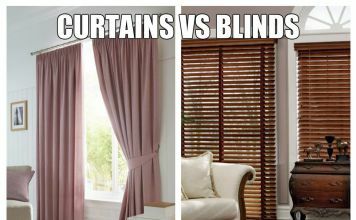 One thing is for certain, however. 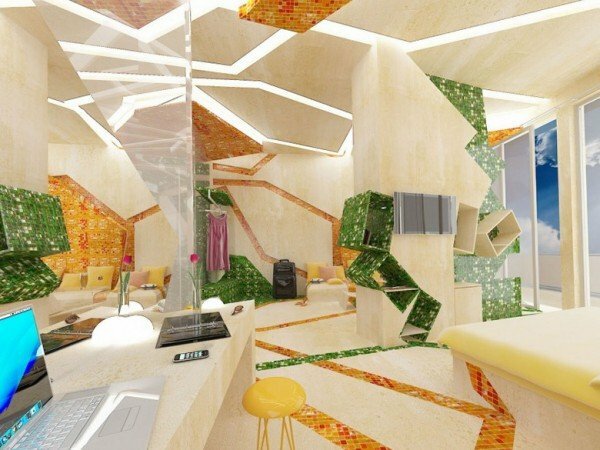 The designs featured here are beyond the norm and are highly imaginative. 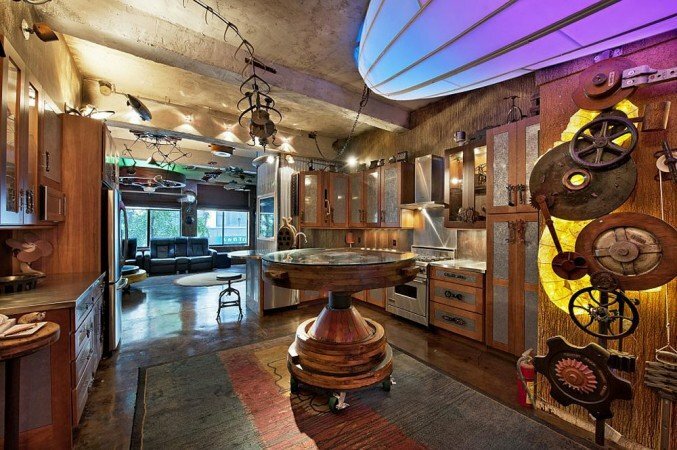 Explore these interiors and get a glimpse into the unique and unusual in interior design. This may remind you of a science fiction movie. 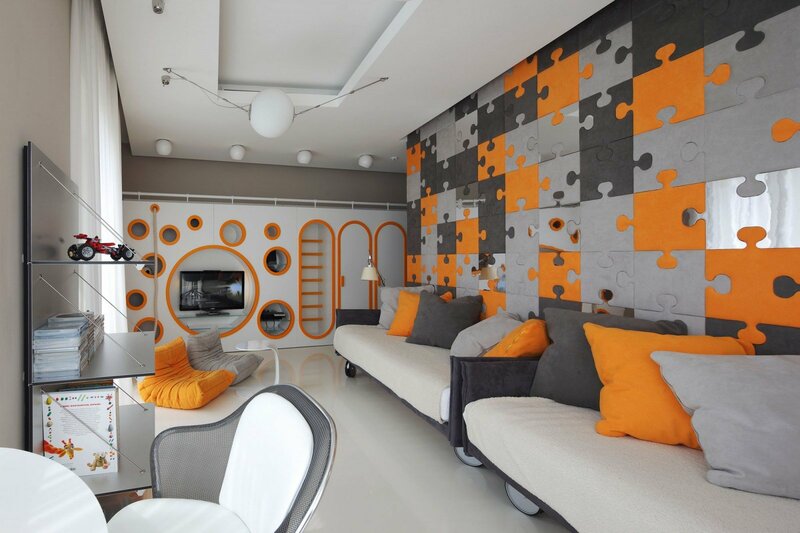 The unique puzzle wall makes a strong statement and ties the colors of the room together. 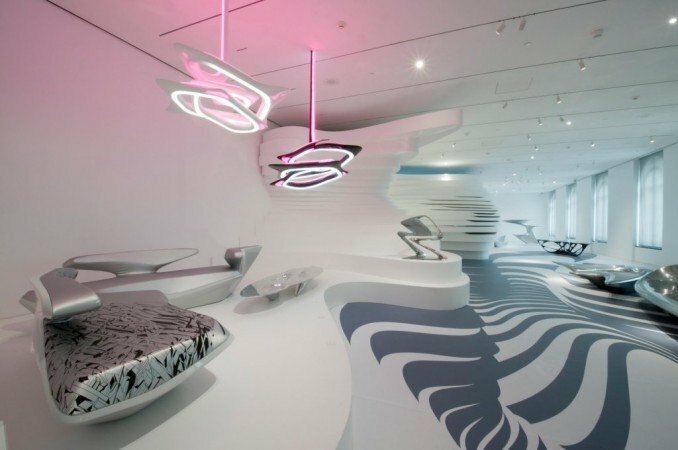 The curves in this space enhance the flow and create a surreal but functional environment. This steampunk interior is imaginative and pays homage to Jules Verne, author of 20,000 Leagues Under the Sea. 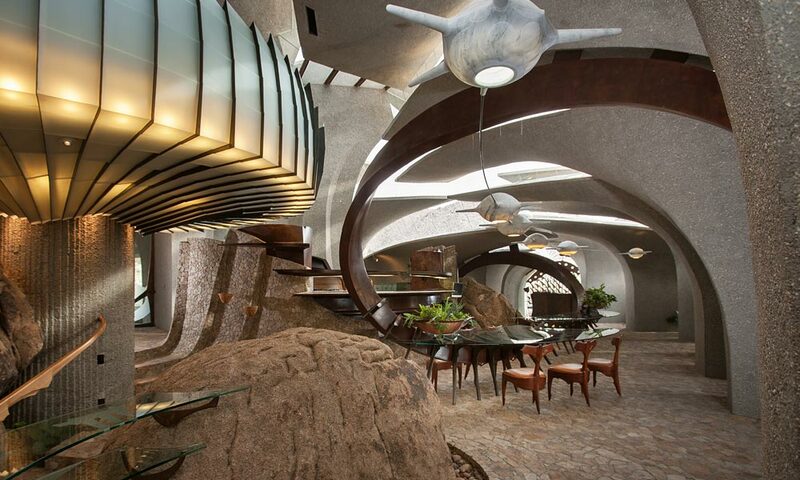 The organic shapes within this architecture are intriguing and boast mid-century appeal. This two-level bedroom features bright color contrasts that lift the space. 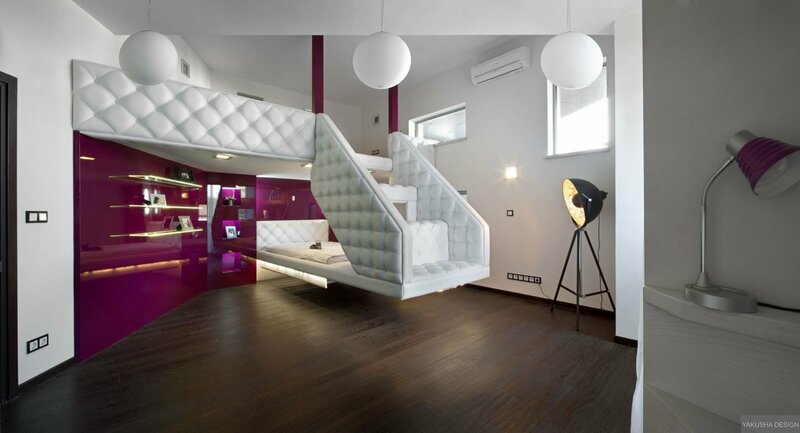 The globe lighting and quilted effect on the railing and stairs lend softness to the otherwise straight lines. 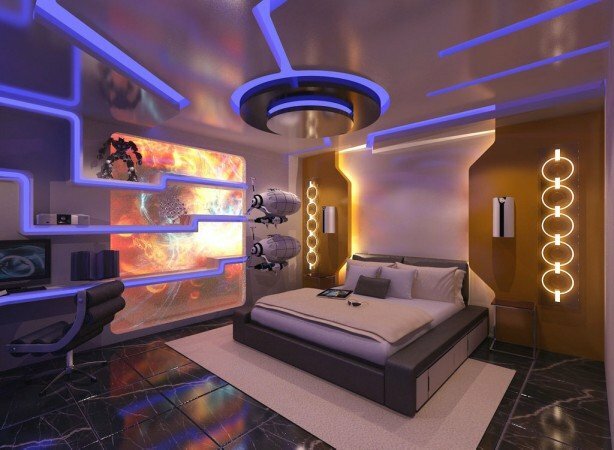 A futuristic bedroom perfect for the imaginative boy who dreams of far away worlds. The architecture gives this space a futuristic feel, while modern furniture carries the look. 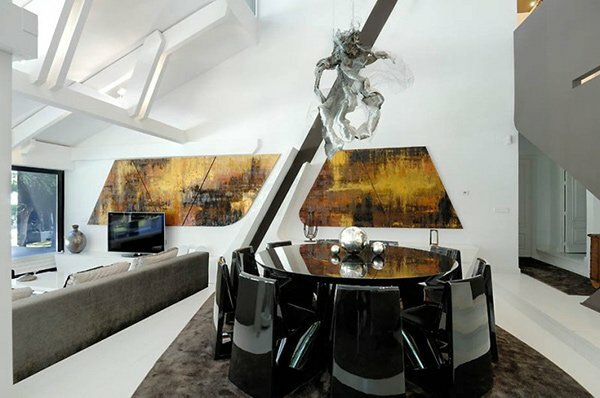 Modern fixtures accent this uniquely shaped room. The texture of the walls against the smooth surface of the flooring creates an interesting contrast. 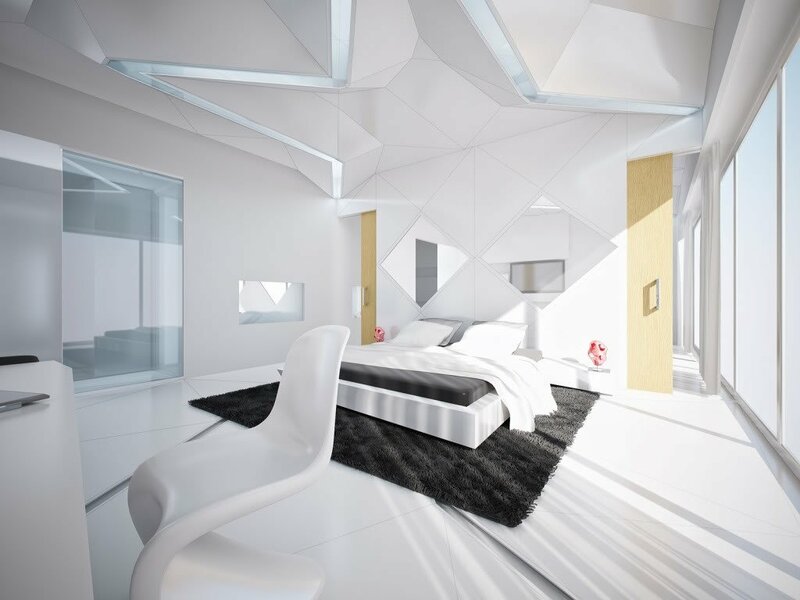 This design resembles a setting for a spaceship sleeping chamber. The curvy floor treatment mimics the architectural curves and the pink neon lighting accents the space. 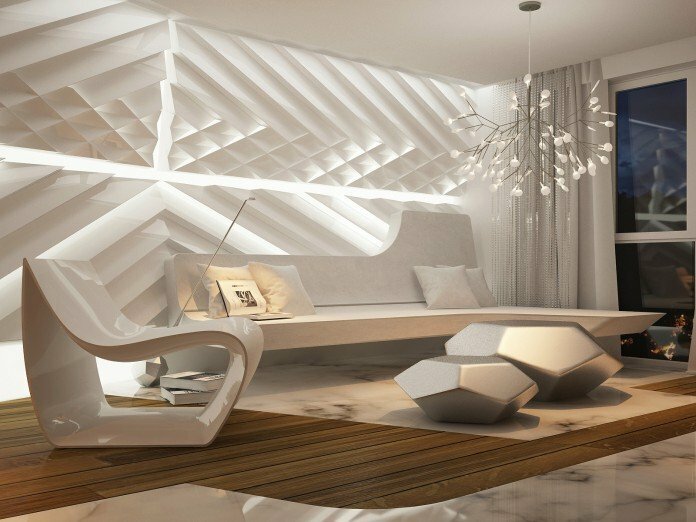 A clean and crisp space with unique ceiling angles. 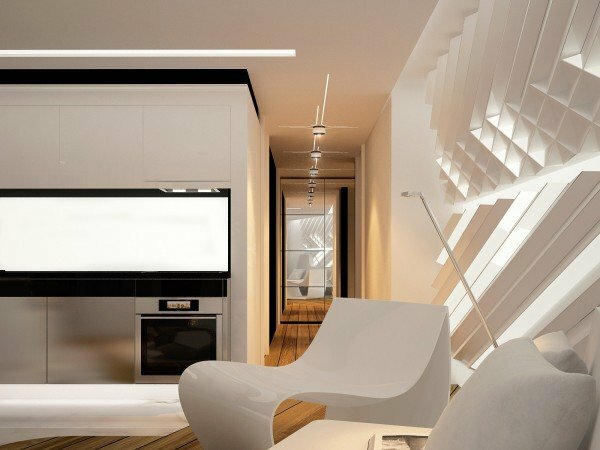 A very clean, fuss-free functional space. 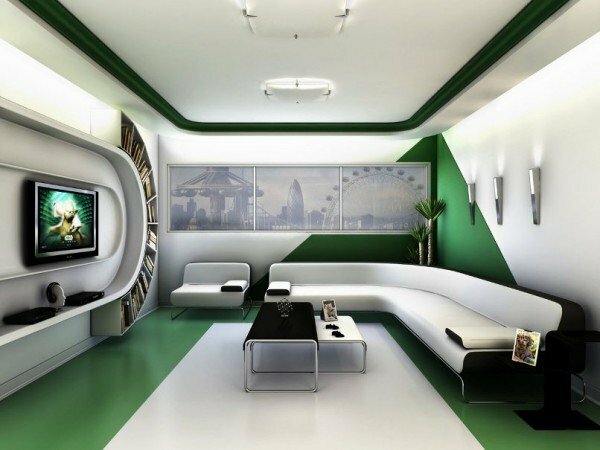 Curved furniture and strong geometric wall features carry this design to the future. The honey wood flooring gives this space warmth. 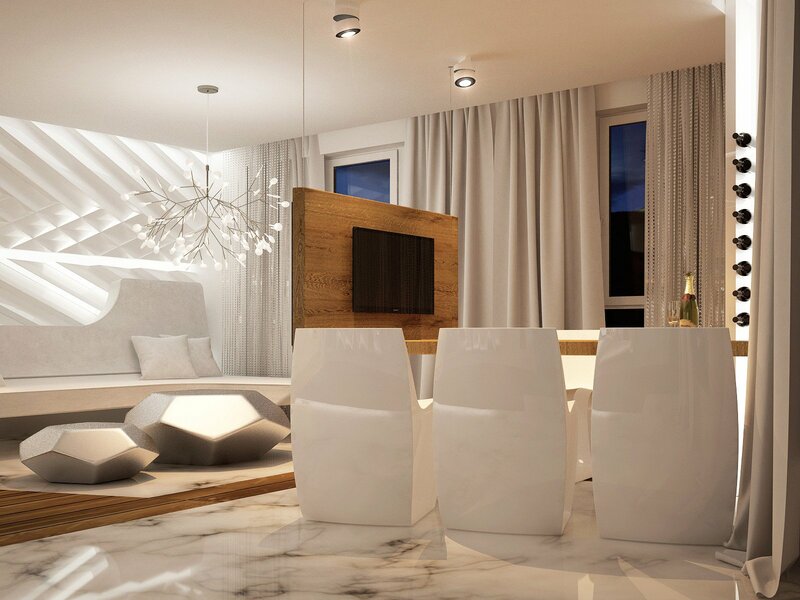 A mix of white tones mixed with light wood accents gives this space warmth and depth. The unique light fixture and sculptured furniture speak to futuristic design. The marble flooring adds a touch of elegance. This room is inspired by ocean waves. You get the distinct impression of being in the wave curve. 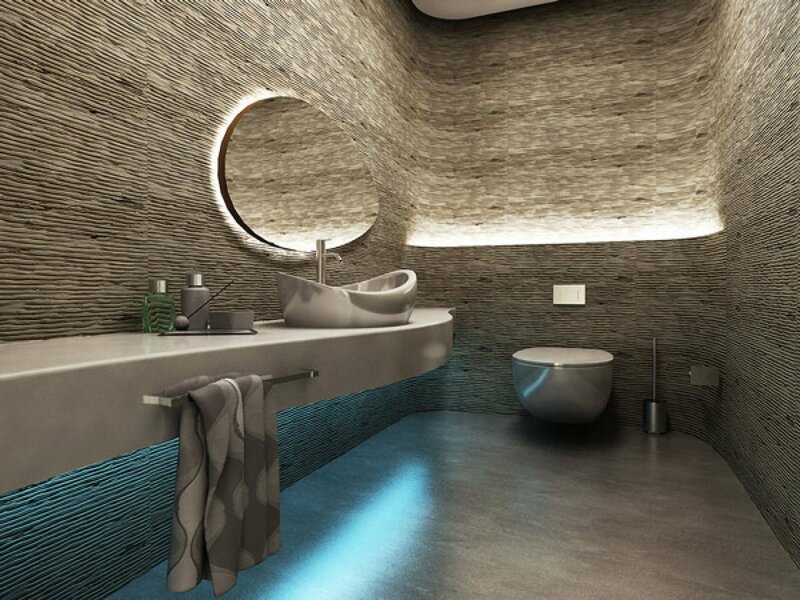 Metallic surfaces mixed with wood bring interest, texture and contrast to this futuristic design. A comfortable spot to watch TV. The green enhances the space, bringing in contrast and interest. The curves create a softness, while the green lines lead one’s eye to those curves. 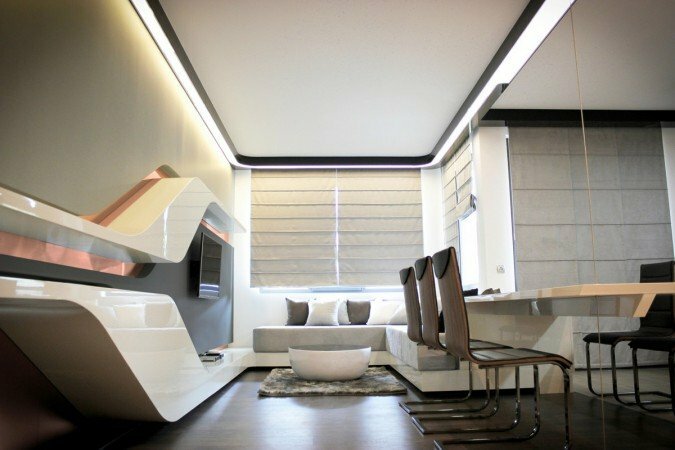 This space is purely modern but has characteristics of futuristic design with the contribution of the blue seating. Interesting shapes and colors enhance this space that is surreal in its overall appeal, as shapes appear to dance across the room. 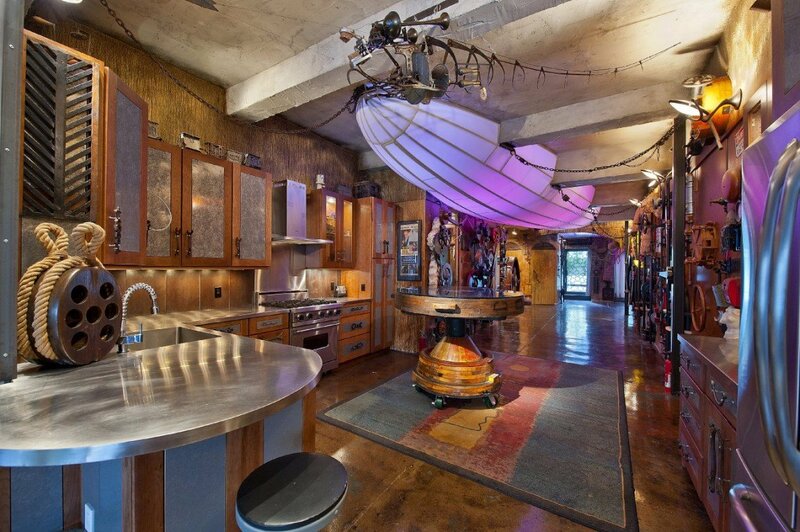 The ceiling of this space lends a very futuristic appeal, while lighting fixtures are more surreal or avant-garde. The mid-century furnishings mesh well with the space. 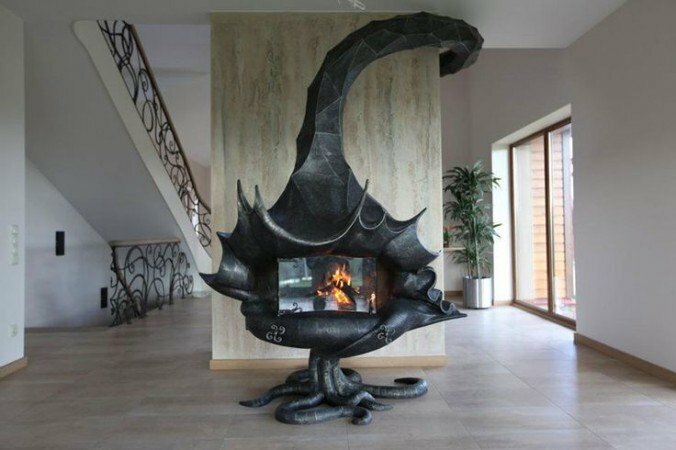 This fireplace is very surreal in appearance with its organic design. A statement piece to be sure! 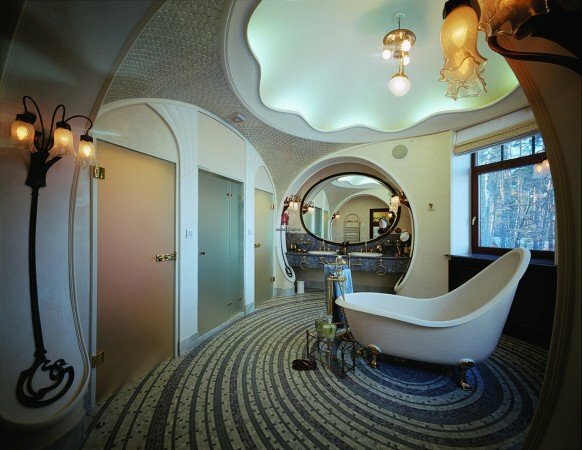 This bathroom is Art Nouveau mixed with a bit of surrealism in the winding circular patterns of the floor and doorways. 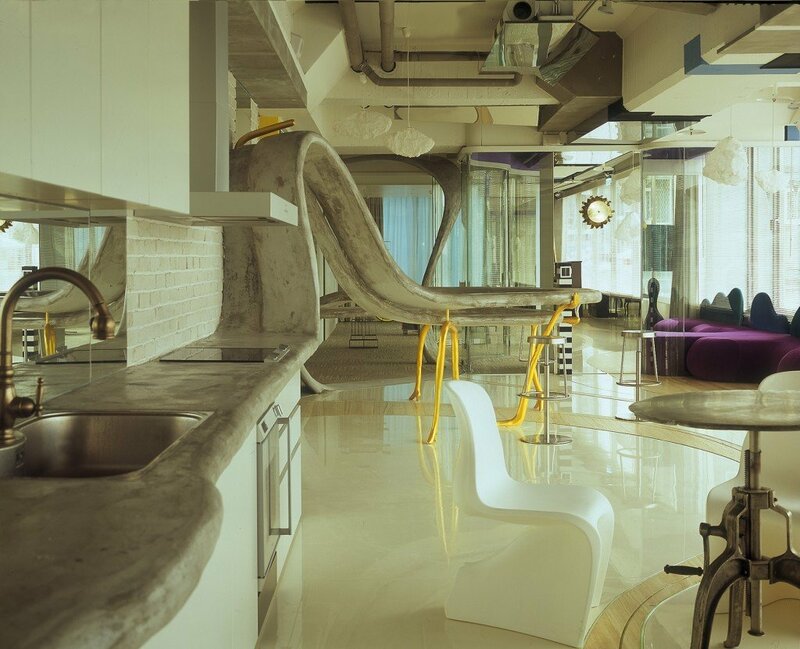 The high-back claw-foot bathtub is the perfect centerpiece to this room. 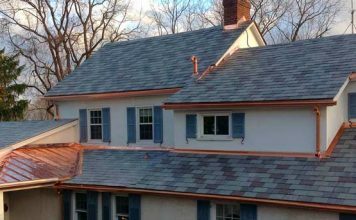 I hope you’ve enjoyed your journey through the future and have recognized the art and creativity that have gone into the creation of these spaces. 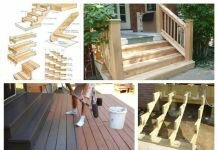 These may inspire a few ideas for your own interiors and lead you to discover new design ideas and aesthetics. Have fun on your journey.